Not often will I say this, but today just stinks. It was a day full of surprises, some good, some not. The morning started quite normal – I swam with my training partner a total of 2,500 meters in an endurance set. I was pleased with my time. Later in the morning I got my first surprise – this was a good one. I had been called to jury duty for this week from Tuesday through Friday. It is a mostly rural county and has few trials, I was informed to call today to make sure jury duty was on. I learned the case settled out of court and I didn’t have to go. Good surprise. This afternoon I picked up my taxes – surprises two. While I owe the state, I am getting a federal refund over double what I have to pay the state. Good surprise. Then I saw the clouds. 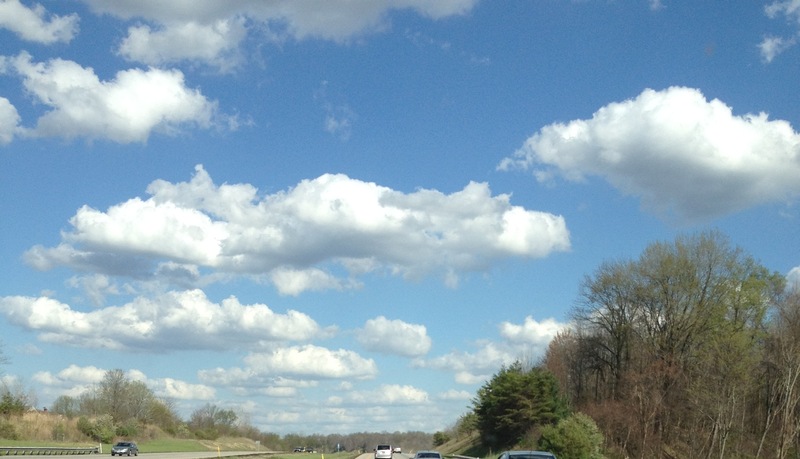 As I was driving home I looked up in the sky and saw the most beautiful puffy cotton ball clouds scattered in a blue sky. Picture perfect in fact. Just like the picture I took of a similar sky on my mother’s birthday. She was in late stages of cancer then and I knew time was short. I took a picture of the sky to remember there is always something beautiful in the midst of sorrow. She died eight days later and that picture remains my wall paper on my iPhone. When I saw the sky today I wondered if it was a reminder and became concerned of what still may happen in the day. I turned into my driveway and found surprise three. The wind was terrible today with strong wind warnings all day, and to prove it I found that my neighbor’s tree broke off a huge limb across my driveway. Fortunately another neighbor with a power saw came over and cut it up. I dragged the limbs into the woods being very careful not to hurt myself, I still had a run to do this evening. It is so good to have helpful neighbors. I don’t want to count that as a surprise, I live in a very friendly community. I headed out to run an hour later than planned so I decided to make it a short three mile run. Well 2.69 miles into my run (thank you Garmin) I got hit with surprise four. Or shall I say I twisted my left ankle on surprise four, the uneven pavement. And I heard a pop. And couldn’t put pressure on it. Fortunately another neighbor, the owner of the tree in fact, was driving home and saw me stumble. He drove over, gave me a ride home the entire tenth of a mile I knew would be difficult to hobble, and I came home and quickly elevated it with ice. See why this just stinks? I think it is a mild sprain. I have it wrapped right now and will ice it again before I go to bed. I have a 10 mile race on the 28th, two weeks away. I hope to be able to run it, hitting the time goal I had is another questions. But I must remember that even in a day that stinks there is something beautiful. Here are my sky pictures. My mom’s sky is on the left. The sky today is on the right. It is rare to see such picture perfect cloud formations. So here is my reminder that every day has something beautiful. Sometimes you just have to look up. Here’s to a quick and complete recovery. Hope it gets better fast nothing worse than missing a race you have been training for. Thank you! And thank you for taking the time to read my blog. 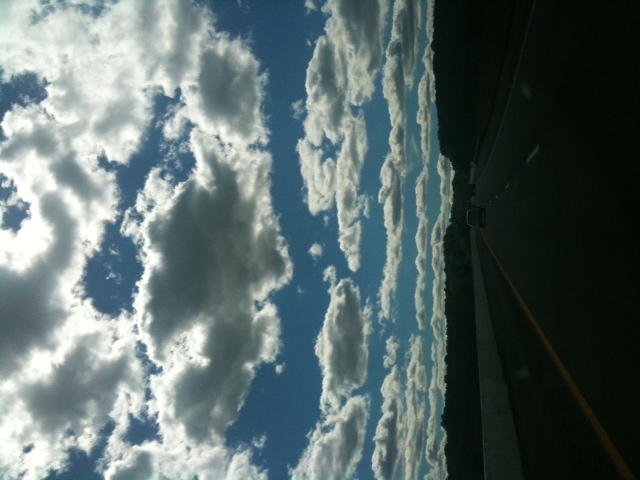 I love your sky pictures. I haven’t written in awhile and I’m glad I did tonight and took the time to read this post. Thank you! Amazing how things like that can change a perspective. The dreaded pop – I hate that. I hope you heal up quick. That last surprise stinks. Hope you recover in time for your race! Thank you, I sure hope so! I hope you feel better soon! Way to keep a positive outlook!